OCEANSIDE — Residents got a first look at conceptual design plans for the new pier restrooms at a community meeting on Wednesday. 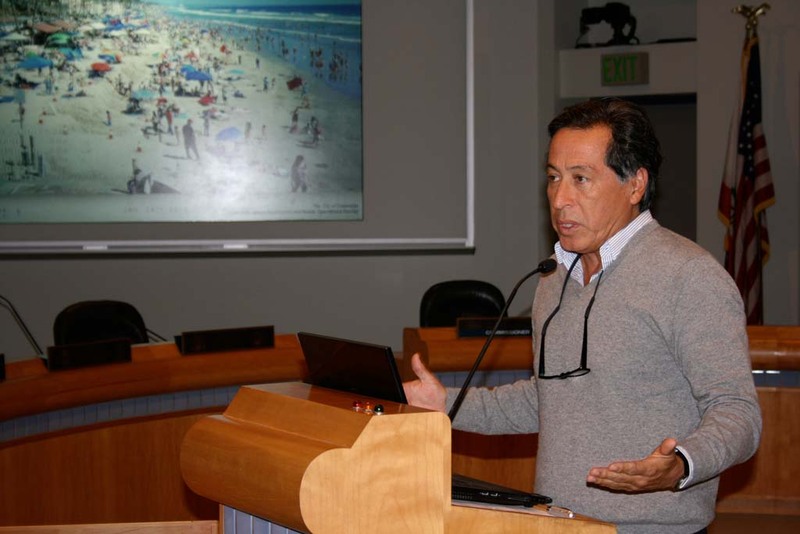 Ricardo Rabines, design principal of Safdie Rabines Architects, shared plans to add two new buildings, renovate the historic bathhouse, upgrade the immediate plaza area, and improve pedestrian beach access from Mission Avenue. Multiple uses will be packed into the site. The end result will be a more functional space that embraces Oceanside’s historical character and future growth. City project manager Nathan Mertz said the project would set the tone for a new look along The Strand. “It will set the bar for waterfront area improvements for the future, and be a successful example of what can be done to facilitate amenities, residents and visitors,” Mertz said. A new building will be constructed in front of the bathhouse to hold 14 unisex single stall restrooms. Restroom stalls will be located on both sides of the building with showers and outside sinks in the middle. Rabines described the restroom building design as open, breezy, happy and transparent. Residents at the Jan. 28 workshop questioned the prominent beachfront location of the restrooms. Mertz said it is critical to have the restrooms in a visible, safe location. A second new building will be two stories tall and face north into the plaza. It will house beach retail and city maintenance facilities on the first floor, and lifeguard facilities on the second floor. There are also plans for a public viewing deck on the second floor with elevator access. Retail uses are expected to include food sales and recreation equipment rentals. Rabines said the historic bathhouse would be restored to its original look. The exterior will be freshened up to recapture the building’s unique character. The interior will be modified to accommodate a police substation. The plaza immediately in front of the bathhouse will be upgraded to include fresh landscaping and benches, and serve as a gathering area. Improvements do not include renovations to the pier amphitheater or bleachers. Changes will also be made to the Mission Avenue stairway access. Proposed plans include stairs, landings and ramps to accommodate families bringing strollers, coolers and Boogie Boards down to the beach. Limiting vehicle traffic on the The Strand to emergency vehicles is also under consideration. Susan Richards, project manager for Safdie Rabines Architects, said design plans look ahead and provide functionality that includes the impact of planned hotels. Mertz and Richards stressed that shared plans are changeable, and community input during conceptual design development is critical to come up with the best possible project. “Everything is under consideration right now,” Mertz said. Project construction is expected to break ground in two years. Concepts plans are anticipated to go to the City Council for approval this June. Then entitlements reviews and environmental approvals will be secured, followed by a call for construction bids in January 2017. Groundbreaking is slated for fall 2017. Building costs have not been determined. Updates on the project will be posted on the city website. Project workshops will be listed on the city’s community calendar, which is also on the website at ci.oceanside.ca.us.